Roseanne Barr appeared on Sean Hannity last night and, of course, they talked about her racist meltdown on Twitter and getting booted from her own show. Barr gave a non-apology and hurled an insult as a topper. Barr described former Obama advisor Valarie Jarrett with a racial slur in May, tweeting “[M]uslim brotherhood & planet of the apes had a baby=vj” in response to a fan who mentioned Jarrett to her. Jarrett is African-American and was born in Iran while her father, who was a doctor, was running a hospital for children there. 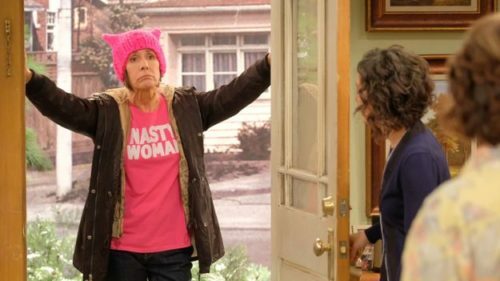 She is not Muslim and both of her parents were born in the U.S.
Barr was fired and her rebooted sitcom was canceled within 24 hours of her tweet. In related news, ABC announced that “The Connors,” the spinoff sitcom starring the cast of “Roseanne” minus, you know, Roseanne, will debut on October 16. But no one’s talking about that because Roseanne attacked Valerie Jarrett again. Imagine that.